A revision of the brief guide to all the new medications, this straightforward, easy-to-understand book teaches nonmedical therapists, clients, and clients' families how different psychotropic drugs work. This handy guide provides information on side effects, indications for use, drug-drug interactions, and suggested dosages. All medical information has been updated for the new volume. Also included are tips on taking medication, practical advice on the client/clinical/psychiatrist relationship, and numerous updated tables and graphs. This handbook is good for nonmedical therapists, clients, and family members seeking to educate themselves about the essentials of psychopharmacology. 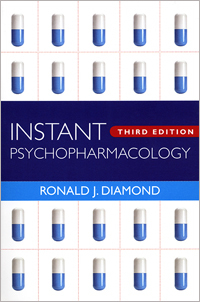 Chapter titles cover the basics of psychopharmacology; medication profiles for antipsychotics, antidepressants, mood-stabilizing medications, and medications for anxiety disorders, sleep problems, borderline personality disorders; and medication lists by generic name, brand name, class, and cost.